Encaustic painting is a relatively new medium for Jo however the technique itself goes back 2000 years. It is actually one of the oldest forms of painting predating tempera, fresco and oils and was first used in ancient Greco-Roman Egypt to paint mummy portraits. Many of these remain in pristine condition today. Encaustic is made from beeswax mixed with damar resin (from a fir tree) which increases the melting point of the wax creating a hard and luminous finish. Pigment, charcoal, pastels and graphite are used to add colour to the wax. 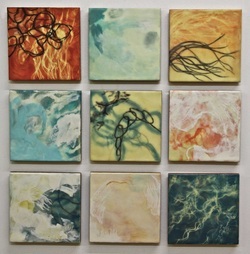 The word Encaustic refers to the ‘burning in’ process used to fuse the layers of wax together. Most of Jo's paintings are made up of between 10 and 20 layers of wax. They give off a wonderful smell of beeswax and honey. Click on the albums titles below to view Jo's work.